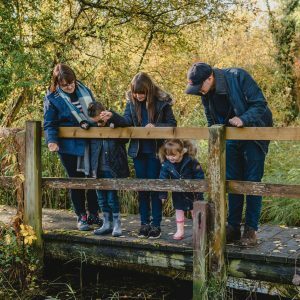 I’m hoping that I’m not the only parent who loves the chance to relive their childhood through their own children. One of my favourite toys as a child was a Bluebird A La Carte Kitchen. I can still remember unwrapping it on Christmas day. The sheer joy of seeing this interactive kitchen that was all mine. I even remember the walk to the sorting office with my mum and my sister to fetch a replacement washing machine door for it when my older sister decided to overfill it and slam the door shut. With this in mind, you can only imagine how quickly I said yes to having the opportunity to receive a Casdon Self Service Supermarket. I couldn’t wait to see what it looked like, the shelves filled with produce and handy shopping basket too. Erm, I mean, I knew that the children would love all these features. 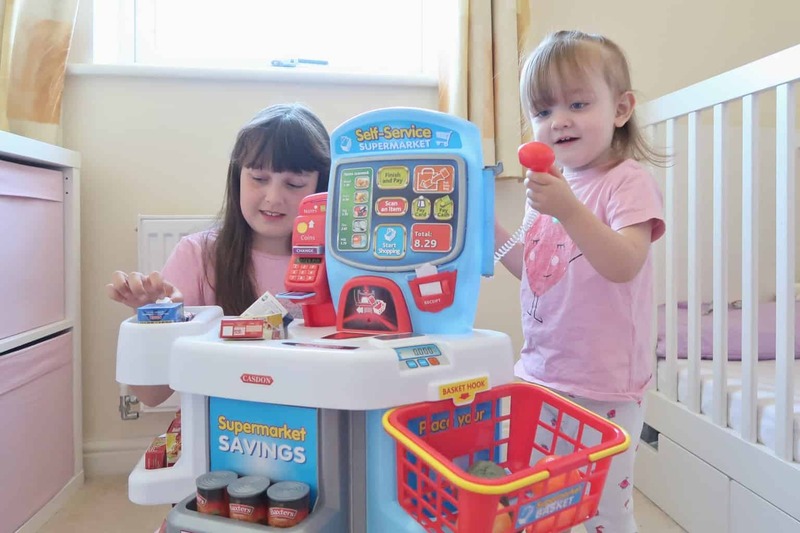 This Self-Service Supermarket Set from Casdon provides hours of role-play fun for your little one! 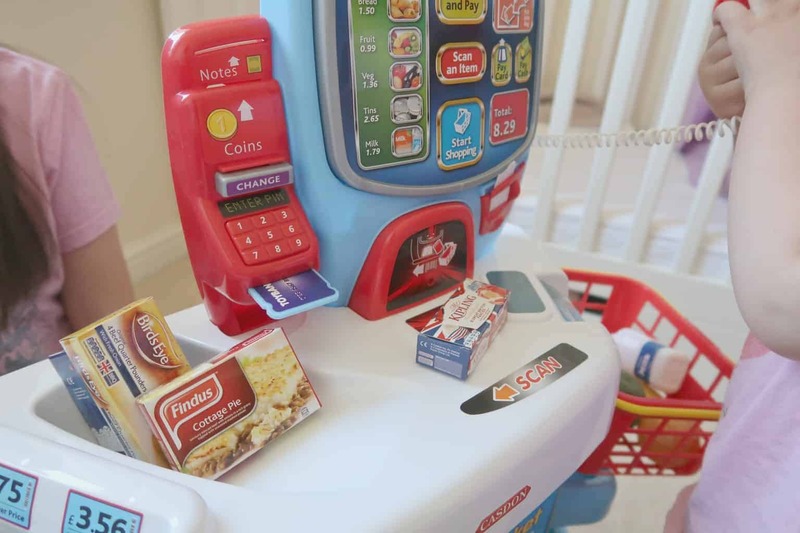 Perfect for playing shop, it comes with lots of accessories and features including a touch-sensitive screen with realistic sound effects, scanner, shopping basket, branded play food, a Chip N Pin machine and plenty of pretend money. 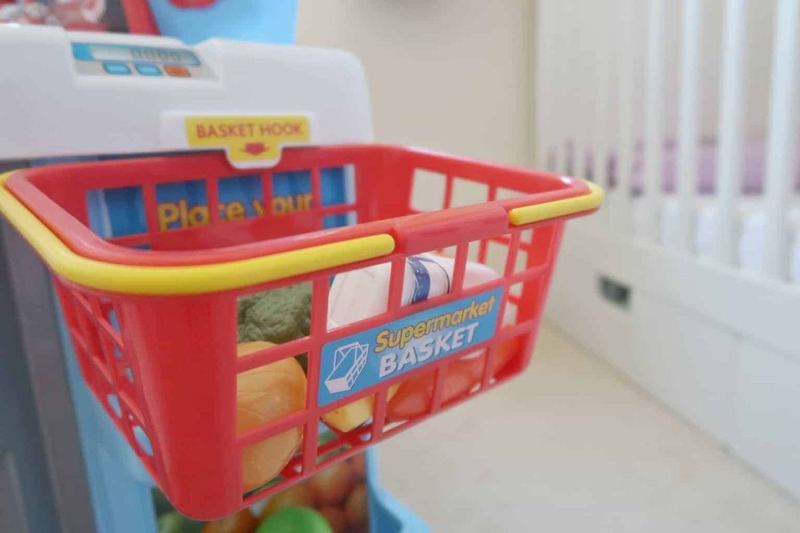 This supermarket play set is also great for encouraging hand-to-eye-coordination, problem-solving and motor skills, as well as developing imagination and social skills in your child while they play. When it comes to putting together new toys, I have learned from past experience that it is so much easier to complete during nap time or when they are at school/nursery – it has absolutely nothing to do with the fact that I might want to have the first go (to check it’s all working correctly – obviously). Assembling the Self Service Supermarket was relatively easy, with the folding of the produce boxes and stickers the main part that took the additional time. Wishing these to place correctly around the toy as it really does bring the supermarket to life. The food boxes are made from cardboard so add an extra element of durability you might want to cover in tape or stick back plastic. The Casdon Self Service Supermarket is packed with different features to encourage learning through play. 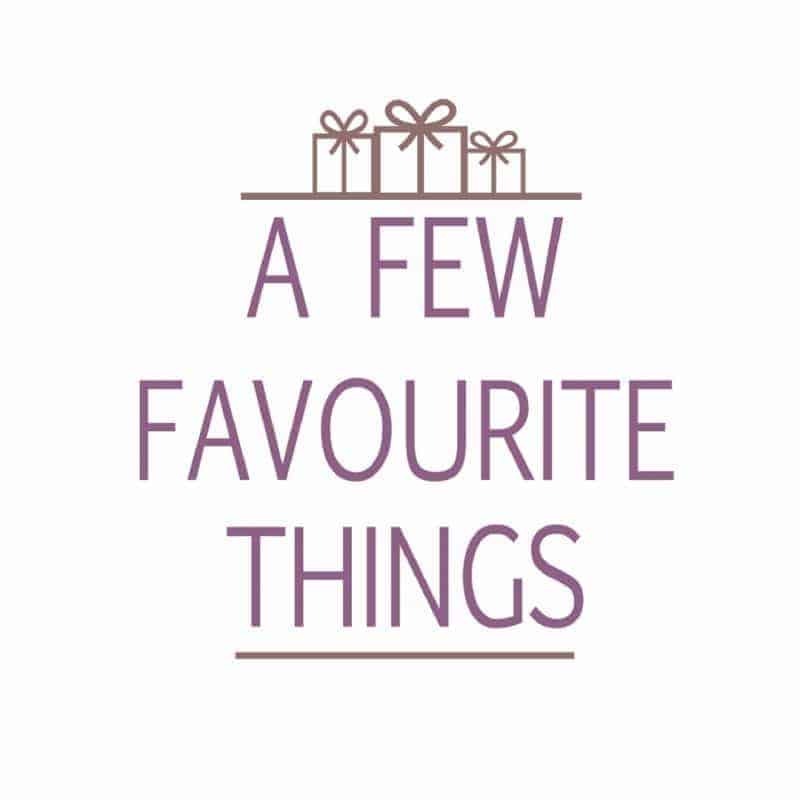 Enabling children of all ages to role-play whether it be a shop assistant or as a customer. The shelves are full of a wide range of branded products some of which will be familiar to the children which helps them select the items they wish to purchase. Placing the items in the red shopping basket included. Which handling hooks onto the self-service supermarket, perfect for when it is time to checkout. The main checkout area features a hand scanner unit, alongside the till unit which bleeps when pressed. Groceries can be swiped across the checkout and placed in the bagging area ready to be taken away after payment. 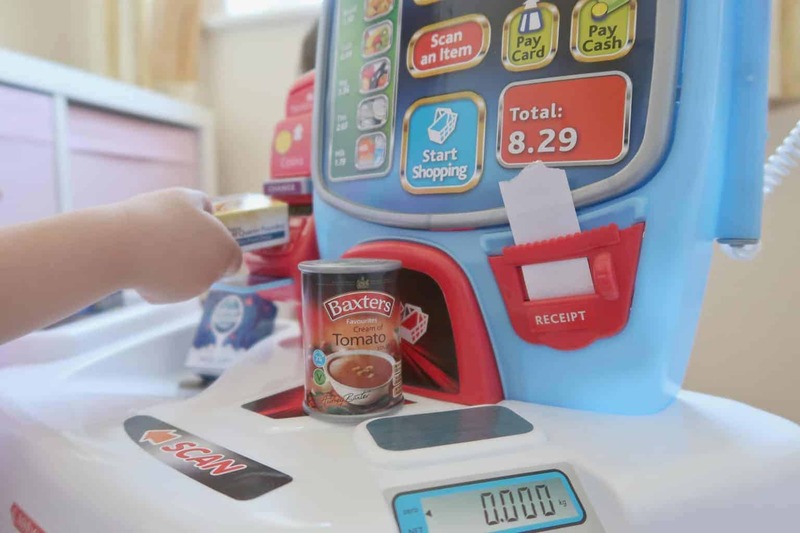 Just like a supermarket that mums and dads visit, children are able to pay in a number of different ways from coins, notes, and payment card. Whilst my excitement of the Self Service Supermarket was well-known, I wasn’t prepared for how much Piglet would love it. Initially not keen on anyone else touching it (the joys of being a toddler), however, she soon warmed up to the idea. Realising that it was so much more fun with your siblings joining in on the action. Roo a willing participant, showing Piglet all the different features of the supermarket. With the hand scanner her favourite, even if she does think it is a phone. 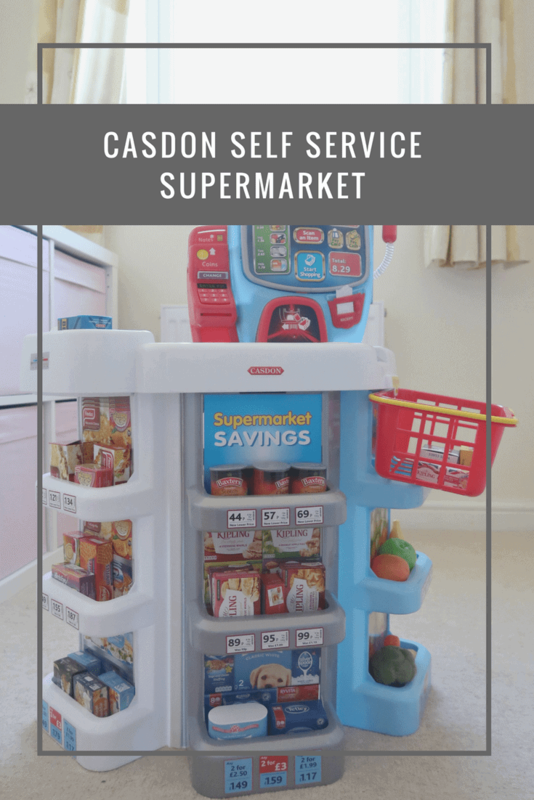 Where can I buy the Casdon Self Service Supermarket? 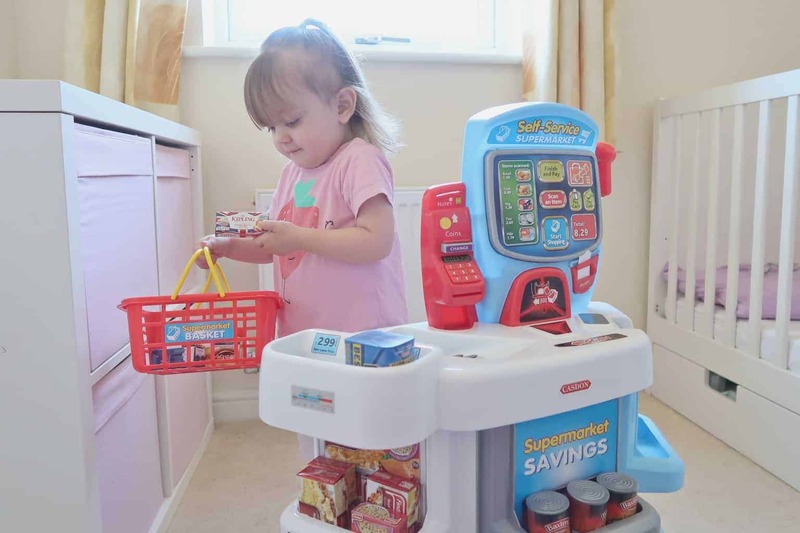 The Casdon Self Service Supermarket is available to buy from Amazon, Argos and all other good toy retailers – priced around £35-40 (depending on current offers available). 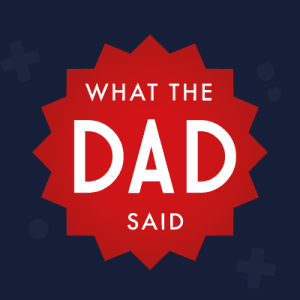 This is so very cute – I know some of my nieces and nephews will love these! 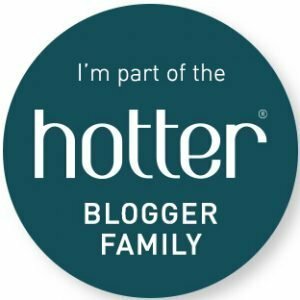 Haha, your post put a smile on my face as both my husband and I tend to buys things ‘for our kids’ but its actually for us as we enjoy playing with it as much as them! The casdon self service supermarket will be a favourite with our kids for sure. This looks like so much fun. My girls love any toys where they feel like they are an adult and this is a great role play one. Oh wow this is so cute, Lillie would have loved something like this when she was a little girl. I remember the A La Carte kitchen too, it brings back happy memories. Role play is such a good way for children to learn, my three were playing shops in the garden at the weekend. Apparently one of them was being given terrible customer service hahaha.